Norisato Nakaima (also known as Kenri Nakaima), the founder of Ryuei Ryu, was born in 1819 in Okinawa, an island in the southern Pacific Ocean located south of Japan. The island was originally named Ryukyu. The inhabitants of Ryukyu supported themselves by trading with China, Korea, and other Southeastern Asian countries. During this time, Ryukyu experienced a strong Chinese influence. The Chinese not only appointed their king, but also served ambassadors to establish trade route and carry out official business. Norisato was well disciplined in the Chinese language. At 18 years old, Norisato would watch military officers practicing martial arts. Norisato was interested in learning a martial art too, but could only learn by watching the officers practice. One day, one of the officers noticed Norisato and began speaking to him. The general took note of Norisato’s interest and invited the strong, young man to China for martial arts training. The following year, after much preparation, Norisato traveled to China. Thanks to the general’s introduction, he became a student of Master Ru Ru Ko, Shihan of the Military School of Ching Dynasty. At the military school, Norisato received a military officer’s education, studying a range of subjects from military strategy to astrology. After several years of training under Master Ru Ru Ko, Norisato received a certificate of graduation and returned to Okinawa at the age of 26. Norisato did not open a martial arts school due to the secrecy of the Chinese Kung Fu. He could not risk exposing the techniques of the military school. He told his family, “The power of the martial arts is to support the heart and defend the body. It should not be used without good reason nor taught to others easily. It should be kept in the family and be taught to one child per generation.” The Nakaima family respectfully followed Norisato’s instructions. As a result, Norisato only passed his knowledge on to one of his sons, Kenchu Nakaima, who then passed his knowledge on to one of his sons, Kenko Nakaima. In 1968, Kenko Nakaima decided it was no longer necessary to keep his family’s style a secret. He then taught Ryuei Ryu to his three sons, two 13 year old students, Tomohiro Arashiro and Takeshi Matsuda, and Tsuguo Sakumoto, a school teacher. Kenko Nakaima also founded the Ryuei Ryu Karate and Kobudo Preservation Society. In 1979, Tomohiro Arashiro was chosen for the task of bringing this traditional style to the United States, and currently remains as the Pan-American Chief Instructor. Since then, the style has continued to become more widely recognized, and is now taught in dojos around the world including Buenos Aires, Argentina, Europe, Caracas, Venezuela, Okinawa, and throughout Asia and the United States. Here in San Diego, Ryuei Ryu is taught at UCSD and Eastlake. The first Eastlake dojo opened in 2004 on Kuhn Drive. Together, Tomohiro Arashiro and one of his students, Edward Teeple instructed students for over 8 years. In October of 2012, Tomohiro Arashiro turned over his part of instruction at the Eastlake dojo to his son, Tony Arashiro, and Edward Teeple. 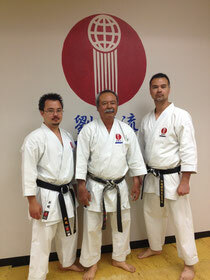 They have instructed students along side Tomohiro Arashiro within the Eastlake Community for over 10 years. Both share the love and passion of teaching, and dedicate their time to continue the tradition by teaching students the art of Okinawan Ryuei Ryu Karate-do.